The NordicTrack GX5.5 Sport Indoor Cycle features a performance monitor, inertia enhanced flywheel, and a wireless heart rate monitor so you can train in the right zone for best results. The backlit LCD display tracks your speed, time, distance, calories burned, and pulse rate. Check out the GX5.5 Sport on Sale Now at the NordicTrack Store! 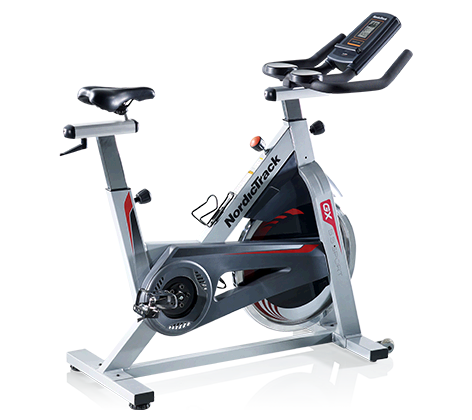 The NordicTrack GX5.5 Sport Indoor Cycle comes with a number of cool features including a chain drive and a rugged 48-pound inertia-enhanced flywheel for a smooth ride every time. 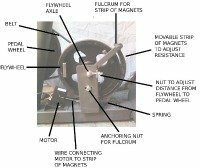 The adjustable resistance knob easily increases or decreases the tension on the flywheel. The commercial grade steel frame is corrosion resistance and features a sleek paint job with orange accents. The handlebars are multi-position and offer elbow pads so you can be comfortable pedaling in a racer stance, or choose different hand positions for riding while standing or seated. The seat adjusts up/down and fore/aft, and the pedals have toe cages and straps so you can choose your pedaling style. 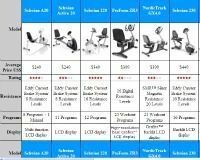 The bike also comes with a wireless chest strap for heart rate training, a water bottle holder, and an indoor cycling workout DVD to give you the feel and excitement of a cycling class. The NordicTrack GX5.5 Sport Indoor Cycle does a lot of things well but that still doesn’t mean you should spend $1,299 for it. If you can get it at around $800 it's a fantastic deal, however. There aren’t many reviews done on the GX5.5 yet, but while we are sure they will be above average on this well-built machine, there isn’t any reason to spend this much on a NordicTrack when you can buy a real Spinner Pro from Star Trac, the cycling bike that started the Spinning Class revolution, for under $1000. Unless you specifically need the 48-lb flywheel, we recommend you go with the commercially proven Star Trac.